This year’s Wetlands Institute was held in Courtenay and Duncan. This 6-day program is sponsored by the BC Wildlife Federation and involves instructors for all over North America. Mimulus was part of the instructional team, focusing on wetland classification, plant identification, and restoration. This year, we built several wetlands to increase the functions within the landscape and to remove weeds. 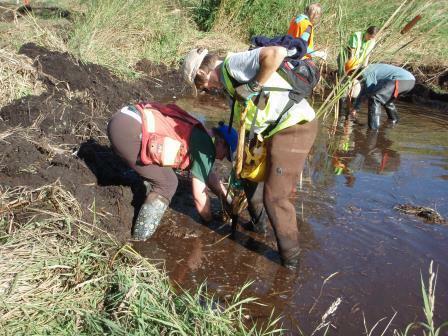 At the 2014 Wetlands Institute, we encountered an old drain while excavating a new wetland. If not removed, this wooden drain would have wicked away our water for the new wetland. Below is a short clip where we found the drain and were measuring how deep to excavate.